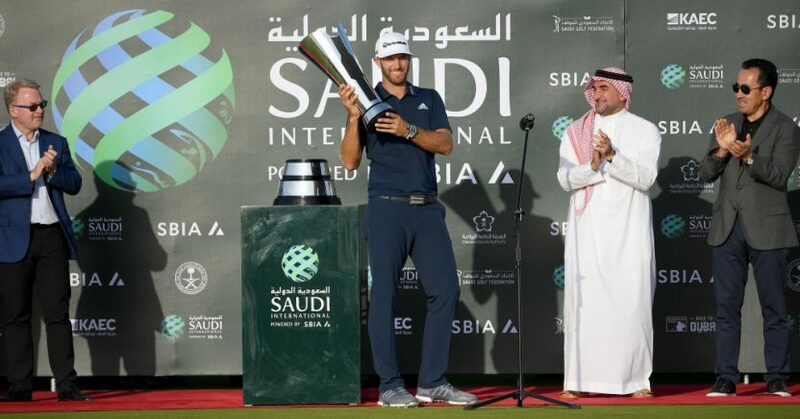 Dustin Johnson held his nerve in a dramatic duel in the sun to hold unto the inaugural Saudi International, the first-ever European Tour event held in Saudi Arabia. Having shot rounds of 68, 61 and 65 to sit 16 under par going into the title showdown with co-leader Haotong Li of China, the American shot a final round of 67 to seal a two-stroke victory at Royal Greens Golf & Country Club in King Abdullah Economic City. Li, a two-time European Tour winner, led briefly after a birdie on the ninth hole put him one stroke in front. Johnson then struck back-to-back birdies on holes 11 and 12 to move back in front. Li’s challenge seemed to have ended after consecutive bogeys on holes 13 and 14, but Johnson bogey on the 16th ensured the pair’s titanic tussle would go the distance. With Li and Johnson going head-to-head, Tom Lewis thrust himself into contention with five straight birdies to open his round. The Englishman’s challenge faded on the back nine, however, and he finished third overall at 16 under par. South Korea’s Lee Min Woo, who finished a stroke further back after his second consecutive seven-under-par 63. A four-under-par final round made Ian Poulter the next best-placed Briton in sixth, while Bradley Dredge and Ross Fisher were in a share of 13th. The tournament itself was mired in controversy, as some golfers, including Paul Casey, stayed away in protest against the Saudi regime’s record on human rights, while four of the world’s top five golfers, including world best Justin Rose and Brooks Koepka, took part on the basis of hefty appearance fees.